Whew! That was a fast week (and a half)! 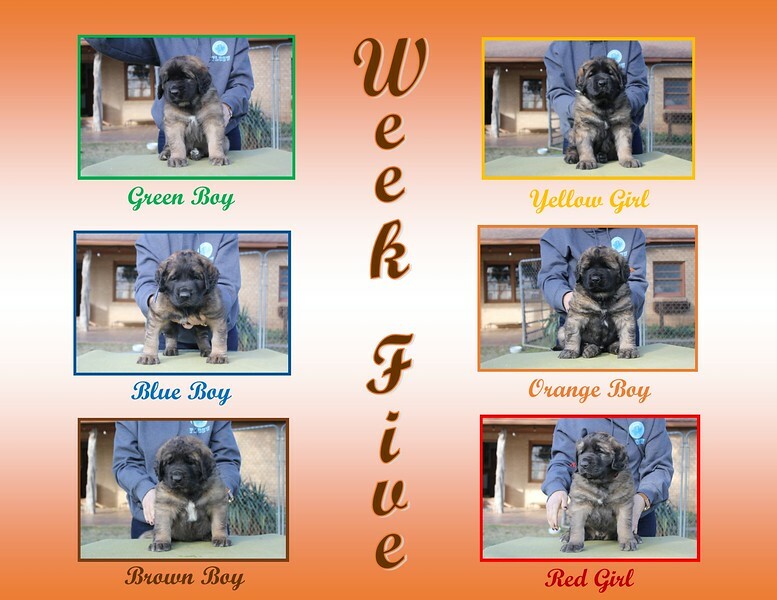 Zippo and I traveled to our Frontier Leonberger Club of the Southwest Regional Specialty show in Pueblo, Colorado on Wednesday, showed Thursday and Friday, and then hustled home to be back with puppies. I'm very grateful to Liz for moving in for those couple of days and taking care of puppies while I was gone. continued with loading the clicker. had their first chew session with a raw meaty bone. started the Puppy Culture Barrier Challenge. graduated to having the run of the kitchen. learned to use the dog door. played with their Daddy Zippo and Aunt Cinder. started enjoying their time out-of-doors. met Biscuit, my 20 year old cat. continued to be introduced to new objects. learned to eat hard kibble, though they still eat meals of softened kibble mixed with pumpkin, probiotic, and canned food. I can't wait to see what their 6th week brings! Click on photo to be taken to the E Litter photo gallery.